Patient transfer is easier thanks to this sturdy, chrome-plated steel design. Featuring a single-handed arm release and an angled front that is comfortable for cast users. It may be used over standard toilets as well.12-quart pail with cover included. 20 1/4" base width; 20 1/2" overall base depth; 17 1/2" width between arms; 14" seat width; 15" overall seat depth; seat height: 17"- 21"; overall height: 28 3/4"- 33 1/4"; 250-lb. weight capacity. Limited lifetime warranty on frame. Six month warranty on handles, feet, seat & lid, push buttons, "wearable" parts. 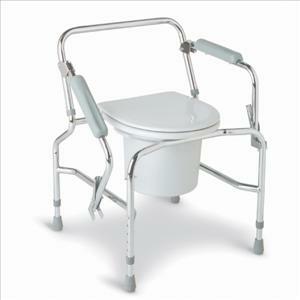 Drop arm steel commode.